Through your child’s eyes, overnight camp is a really big deal. But, when they say they’re feeling nervous about it, it may not help them to hear you say, “It’ll be great. You’ll see when you get there. You have nothing to worry about.” If you try to simply soothe and dissolve their feelings, those feelings won’t just go away. They’ll still have nerves and anxieties inside, but now they may not feel welcome to share them. Instead, you can accept and make space for their concerns, sitting down to listen. In the light of your example, they’ll be more likely to accept their own feelings and have compassion for themselves. From this place, they’ll feel more empowered to release some of the tension and start turning toward solutions with you. Anxiety and nervous feelings are completely natural reactions to new and unfamiliar experiences, especially when your child may be separated from you for a couple of weeks. And these feelings aren’t just for first-time campers; we have second- and third-time campers who worry about how much they’re going to miss their parents and their pets or about hiking out farther this year for the Outpost overnight backpacking trip. The excitement about camp wins out in the end, but it’s still good to help kids explore this overall experience of uncharted territory and embrace their nervous feelings as opportunities for adventuring into themselves. It may seem like a no-brainer that your kid would bring along their teddy bear or other stuffed favorite. That’s actually one of the items on our comprehensive packing list! But by making a point of talking about that companion—or a comforting book or photos of the family—as a little piece of home, your child has a tool to help them feel stronger as they venture off into the exciting unknown. My mom and I had a special deal that we would both go outside […before bed] every night and look up at the stars and say goodnight. When I looked up, I knew that she was looking up too. Woven right into camp’s fun and games are constant learning and growing experiences, and those start right now, even months before it’s time to close up the trunk and go. The best thing you can do is to help your child be present for their experiences and reassure them that there is nothing wrong with being nervous. If you can recall an experience from your childhood when you felt overwhelmed by something new and intimidating, share it with them, and try to dip back into how it really was for your younger self. Encourage them to think out loud and give voice to their specific anxieties. Without judging or minimizing their feelings, talk about their concerns and help to bring them down to earth. Just talking out situations that inspire anxiety can take away some of that unsettling power. When sleepaway camp feels like an altogether overwhelming prospect, it helps to break it down into more manageable pieces. If your child is worried about feeling lonely because they don’t know anybody else who’s going to the same camp, help them to think about ways of making friends. They might set a goal of saying “hi” to one new camper each day. Chances are they’ll exceed that goal, but by guiding them to commit to one small and straightforward challenge at a time, they’ll start to feel some control over those anxieties that were too big to even approach before. Writing a few of these bite-sized goals down can help the commitment sink in even more, and then your camper will have a reminder they can pack right along with everything else. Maybe they can post those goals on the wall by their bunk next to photos of you and the rest of the family. Ultimately, narrowing in on the goals that will go the distance in easing some of your kid’s biggest anxieties will depend on both of you sitting down together to really explore their feelings. If your first-time camper is having a hard time overpowering their own restless imagination, it might be time to reach out and make a real connection with someone from camp. Don’t be shy about calling the camp office. Ours is open year round, and we love talking candidly about all of camp’s rewards and challenges. Ask if you can put your soon-to-be camper on the phone to ask some questions of their own. This way, they can start thinking of camp as a real experience and a community of kind people—pulling them out of their imagination’s crash course in what-ifs. When you first sit down to talk and help untangle their concerns, you might also come up with some related questions they can ask when you call. What will the day actually look like from the time I wake up to the time I go to sleep? How will I be able to stay in touch with my family during the two weeks? Is it possible to set up a call with a camper who’s been to Kennolyn before? Better yet, schedule a visit to your summer camp so your kid can experience it firsthand in full color. After all, the sleepaway camp prospect may be so new and unfamiliar that they’re not even fully able to put words to their questions and uncertainties. If they don’t know what camp looks and feels like, how can they know what they should be worried about or prepared for? That conundrum can absolutely be overwhelming for kids facing their first time at overnight summer camp. 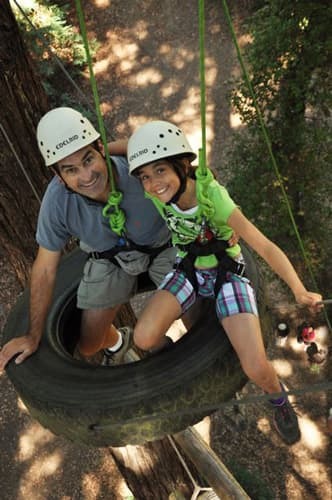 Setting foot on that unfamiliar territory will not only demystify the unknown; it will also spark a connection between your child and the real but hard-to-describe magic that is summer camp. Our community really is built on contagious kindness and the spirit of tradition reaching back through more than 70 years of interconnected campers. Kids have an amazing ability to tune into that kind of magic and to recognize how important their own contribution is to carrying the tradition of kindness forward. By coming out for a visit, they can get a real sense of their inspired responsibility within a generous and supportive environment. Your child’s worries may not disappear altogether, but they’ll be in an even better position to understand how those uncertainties really are opportunities not to be missed. Our Resident Camp is for kids entering grades 1–12, and we offer a huge range of activities, so kids never run out of those opportunities to explore the unknown during one- and two-week sessions. We also offer Intro and Mini Camps for just two or four nights’ stay for kids who aren’t quite ready for a full week away at camp. If you think Kennolyn might be right for your camper—or if you’re already registered and have some questions—give us a call.